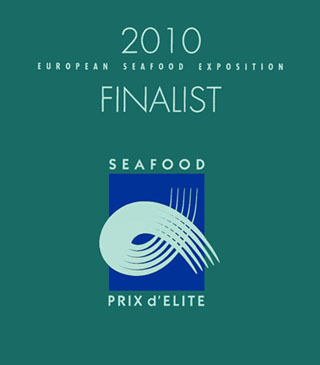 The finalists for the European Seafood Exposition 2010 Prix d’Elite Awards were announced on Monday by event organizer Diversified Business Communications of Portland, Maine. The winners will be announced at an awards reception from 6:15 to 8 p.m. on Tuesday, 27 April in Auditorium 2000 Parc des Expositions in Brussels, Belgium. Awards will be presented to the best new retail and foodservice products. Plancha from Salm Invest S.A.
Starfish Gluten Free Crispy Battered Cod from Starfish Inc.
Farm Raised Short Nose Sturgeon Caviar from Supreme Sturgeon & Caviar Ltd.
Sushimi from Vichiunai Europe N.V.
Barramundi Flame Grill from Vinh Hoan Corp.
Last year, Deutsche See GmbH’s Seasonal Fresh Fish Convenience-Salmon in a Wooden Leaf took home the best new retail product award, while Alfocan S.A.’s Crayfish Skewers won the best new foodservice award.